Yahoo Mail sign-in allows you to access Yahoo products and services like Mail, Yahoo News, Yahoo Sports, Yahoo Finance, etc. You can also use Flicker, photo sharing service by Yahoo, and personalized Yahoo Search engine. But you need to have Yahoo account first. If you’ve not signed up for Yahoo Mail account, then learn more on sign up for a new Yahoo account. 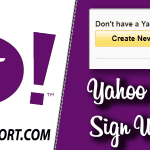 You can complete Yahoo Mail sign in a few easy steps. As it’s revealed millions of Yahoo users have been hacked, we recommend you to change Yahoo password and enable 2 step verification. Open Yahoomail.com from any web browser. Enter Yahoo email address (Yahoo Username) and click ‘Next‘. Tick-out ‘Stay signed in‘ box if you’re using any public devices to sign in to Yahoo Mail account. Enabling this will save login credentials as cookies, and someone next to you may get access to your Yahoo account. Enter the Yahoo Mail login password and click ‘Sign in‘. Passwords are case sensitive in nature. Remember, you’ve to enter the same characters as you’ve used while signing up Yahoo Mail account. 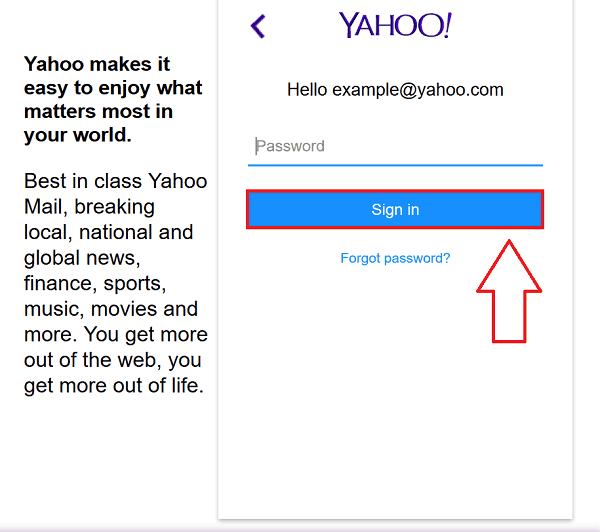 If you came to forget current Yahoo mail password, learn how to reset Yahoo password here. You will reach into Yahoo inbox. 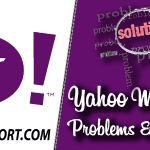 If you face any problem in sign into YahooMail, visit our Yahoo mail login problems page. If you do not want your web browser to remember your login credentials, please un-check the ‘Stay signed in‘ option after entering your email address. Yahoo email login can be accessed via mobile. There are many apps for Yahoo Mail login, like Microsoft Outlook app and other. Following instruction are for the Official Mail app of Yahoo. Install ‘Yahoo Mail – Free Email App‘ from the Google play store. Open ‘Yahoo Mail’ app and tap ‘Sign in‘. Enter your Yahoo email and tap ‘Next‘. Type your password and tap ‘Sign in‘. And you will reach into Yahoo inbox where you can manage your emails. Download ‘Yahoo Mail – Free Email App’ from the App Store. Open Mail app from Yahoo and touch ‘Sign in‘ option. Enter your Yahoo email id and choose ‘Next‘. Enter Yahoo password and select ‘Sign in‘. You can sign in to Yahoo mail with on-demand password. In on-demand password, you don’t need your regular password, you’ll get a new password in text for each time you have to Yahoo.com login. It’s different from two-factor authentication. If you have enabled two-step verification in Yahoo Mail, you require additional security code along with the regular password to access your Yahoo account. You will receive a verification code via text or call. So if you are worried about your Yahoo mail security, then we suggest enabling two-step verification. And if you caught on any issues, then you may visit Yahoo email sign in help page on official Yahoo support forum. On 7/15 there was an update on yahoo mail and since I’ve been unable to access my email on outlook 2010 and 2013 (on 2 different computers) since. I’ve tried to reset up the account on 2013 completely from scratch, no luck. Re did account completely on 2010, same result. get message #MBR1212 – Incorrect user or password. Went to Yahoo mail on web, re-logged in went smooth. Email works on cell phone with user and password. IMAP is the best way to connect your Yahoo Mail account to a desktop mail client or mobile app. It allows 2-way syncing, which means everything you do remotely is reflected in your Yahoo Mail account no matter where or how you access it. Here are the settings you’ll need to configure your mail client or app. Hello there! If you’ve updated and verified your mobile number to Yahoo Mail account before, then you can have access to reset Yahoo password using phone number. 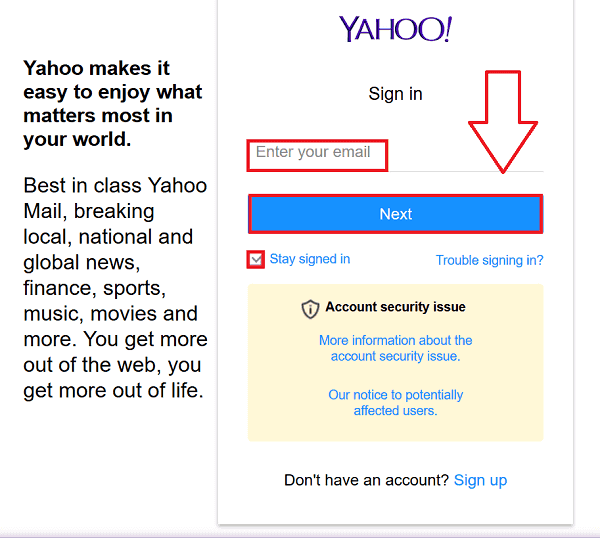 If yes, click on ‘I don’t have access to this email’ link on Yahoo sign in Helper page. Enter two missing digits of your mobile number and follow the instructions. Been logging into my email just about every day. Now yesterday, I go to log back in after checking my email earlier in the day just to get some bs message saying there’s been suspicious activity on my account and to verify who I am. I put my username and password in again and it says it wants to send a code to my old yahoo email address. This is an old email address that I no longer have access to because of the ridiculous nonsense yahoo is always pulling. I hit the alternative verification and it loops me back to sending the code back to the old email address. I didn’t put a phone number for recovery because my phone was broke at the time. Now no way of recovering my important emails. It’s ridiculous to ask a person to have two email addresses just to set up one in case Yahoo screws up again. The HELP section should be renamed “Don’t bother because you’re just going to get jerked around, waste valuable time and still not be able to get into your email. No wonder so many people are getting away from yahoo mail and going with something else. No matter but get my back my yahoo mail i never read. I would appreciate it if someone could inform me how to use my Yahoo mail account without signing up for the increased security being offered. I have been using Yahoo mail for over 15 years and have been completely satisfied with it… except when enforced changes have been mandated. I do not wish to utilize the new security options which have been offered at each mail sign in for the last months. Today it seems that I am unable to use Yahoo mail unless I agree to these new security options, which include changing passwords. I will change to another e-mail provider before I will use these new options. I feel these are needless, useless changes that benefit no one but the providers and developers of these garbage changes. I wonder how much business you will lose because of these needless changes; or perhaps most people have bowed down to this recent trend dictating customers sign up for useless problematic system changes for corporate benefit. 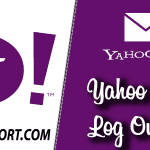 If you’re unable to log into Yahoo Mail account with your login password, then recover Yahoo Mail password using the Phone number, alternative email address, or secret question that you’ve set while registering Yahoo Mail account. 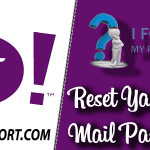 You can follow steps to Reset Yahoo mail password here.